Based on the findings of the Longman Learners Corpus, the Longman Active Study Dictionary is unique in the way it aims to exercise students minds while satisfying their specific language queries. It actively encourages them to develop their language skills through a built-in workbook, vocabulary exercises, study notes and full-colour illustrations. Salient Features 45,000 words and phrases-that’s all intermediate learners could possibly need. The real-life examples-based on the Longman Corpus Network, and covering written and spoken, British and American English-ensure that learners can see instantly how words are really used. Learners should concentrate first on learning the important words they will need for everyday use, so these 3000 “Active Words” are highlighted. Learners appreciate on-the-spot help, so the Longman Active Study Dictionary includes Grammar and Spelling Tips every four pages. For extra practice at home, there are Study Pages covering grammar and usage problems, and a Workbook with exercises to help learners get the most from the dictionary. Full-page colour illustrations have accompanying exercises based on certain topics, while black and white pictures throughout the text aid understanding of difficult words. 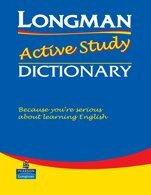 Buy the book Longman Active Study Dictionary of English from Ideakart.com.